UK scientists have created a tiny generator powered by ordinary vibration from the environment. A masterpiece of Vibration Energy Scavenging, this tiny (less than one cubic centimeter) device would have a variety of uses. Dr. Steve Beeby, of the University of Southampton, uses magnets on a cantilever to generate power. 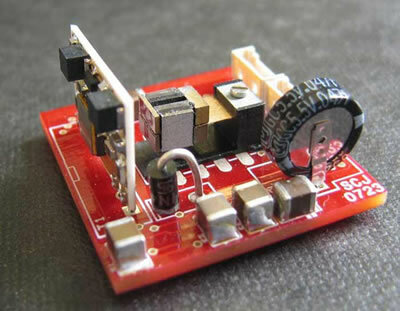 As the magnetw wobble, a tiny amount of power measured in microwatts is generated. "The big advantage of wireless sensor systems is that by removing wires and batteries, there is the potential for embedding sensors in previously inaccessible locations..."
This device could power sensors in high-vibration equipment (like air compressors), but might also be adapted for use in the human heart. The constant beats might provide power for pacemakers or other devices. Science fiction fans of course remember an early example of power scavenging - also called parasitic power harvesting - in the stillsuit from Frank Herbert's 1965 masterpiece Dune. Motions of the body, especially breathing, and some osmotic action provide the pumping force.